Take a magical journey through the stunning islands of Fiji, an archipelago of over 330 islands dotting the horizons of the South Pacific Ocean. Blue Lagoon Cruises takes you on a journey to see the 'real' Fiji, through the Mamanuca and Yasawa Island groups sitting off the western coast of Viti Levu, offering some of the most beautiful and striking scenery on offer in Fiji. You'll see traditional Fijian villages, swim in crystal clear lagoons and gaze out on idyllic tropical scenes you previously thought only existed in the movies! The small size of Blue Lagoon Cruises boutique cruise ship, Fiji Princess is just one of the things that makes your cruise so special. 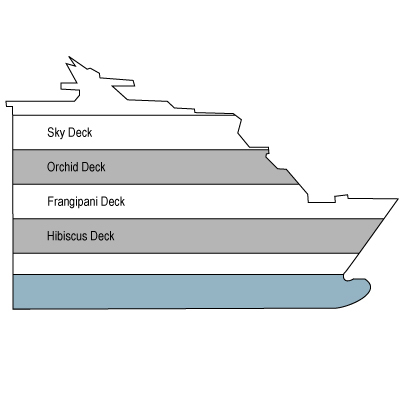 Accommodating up to 68 passengers and measuring only 179 feet (55 metres) in length, Fiji Princess can access bays and islands that would be impossible to reach in a large ship. You can get so close to shore, that you can tie off a coconut tree and you can swim to the beach!